After spending most of the summer in Bad Axe or Rifle Lake, we decided to do some traveling on our own. Earlier this year I met (virtually) Jim and Diana Belisle. 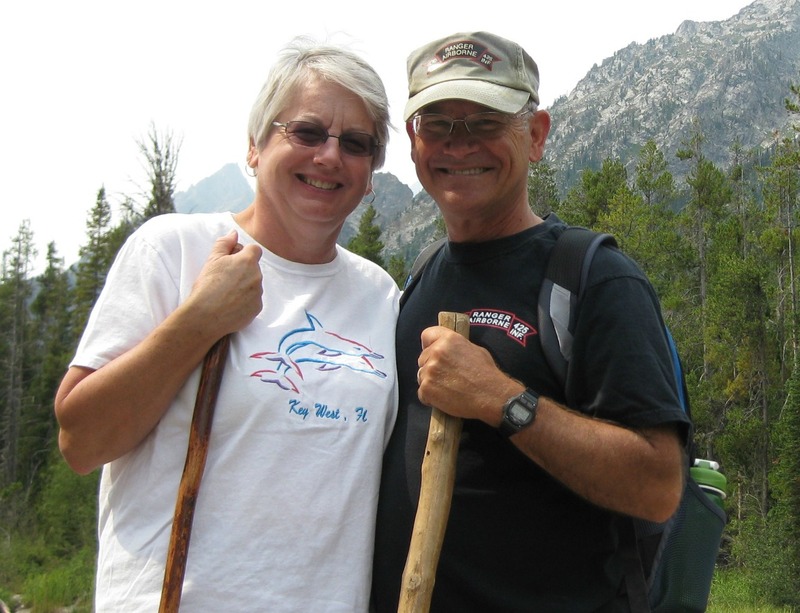 Jim and Diana are also fulltime RVers from Michigan and are “workkamping” at the Cherry Hill RV Resort near Suttons Bay. 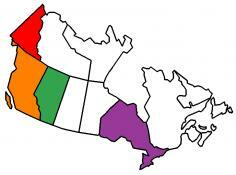 Jim also maintains a blog like ours – ExploRVistas. On August 21st we drove through some big rain storms to arrive at Cherry Hill. Jim and Diana met us on arrival and we made plans to meet for dinner that night. Cherry Hill is nestled in the wine country of the Leelanau Peninsula. This part of Michigan, right on the 45th Parallel, has much of the same weather as the wine growing regions of Central Germany and has been the center of Michigan’s wine industry for years. We took a day to visit a number of local wineries, sampled their wines, and returned with several bottles to add to our wine collection. While we were touring wineries, I was also looking for local geocaches. While looking for one, we toured the Inland Seas Education Program. This is a great place to learn about the inland lakes of Michigan. The 77′ Great Lakes Schoolship, “Inland Seas.” sails students in the Suttons Bay area to become “scientists for the day.” They assist in sailing the vessel and learn about local history and geology. Suttons Bay is a popular tourist destination and has many eclectic eateries. I surprised Pat with fresh cut flowers for our 42nd wedding anniversary, and we celebrated by going out to dinner at the Boones North Country Grill Pub. I had thoughts of eating on the patio but the weather didn’t support that. We were able to get a nice table by a window and had a wonderful meal. 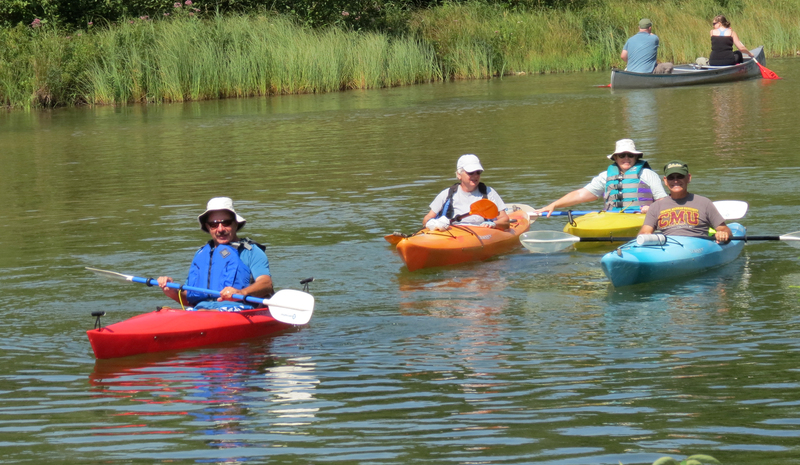 We were joined by Jim and Diana for a day of kayaking on the Platte River. The Platte is an easy-going river and a fun paddle. We started at the National Forest Campground and ended in Lake Michigan. The weather was wonderful and we had a great time. We took a side trip on the way back to stop at the National Park Service Visitor Center and get some more information on the area. We climbed part of the Sleeping Bear sand dune and toured the restored buildings of Historic Glen Haven. 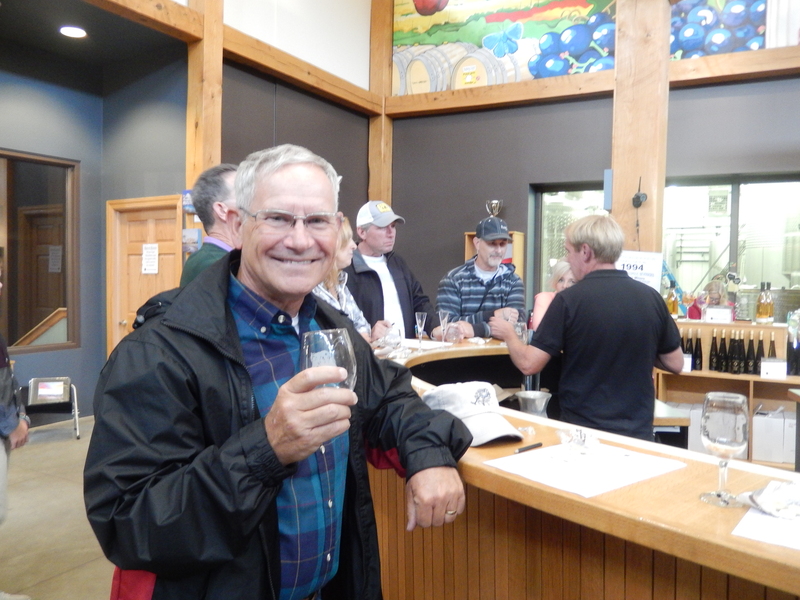 Our final stop was the Cherry Republic in Lake Leelanau which included tastings of cherry jam, cherry salsa, chocolate covered cherries and, of course, cherry wine. 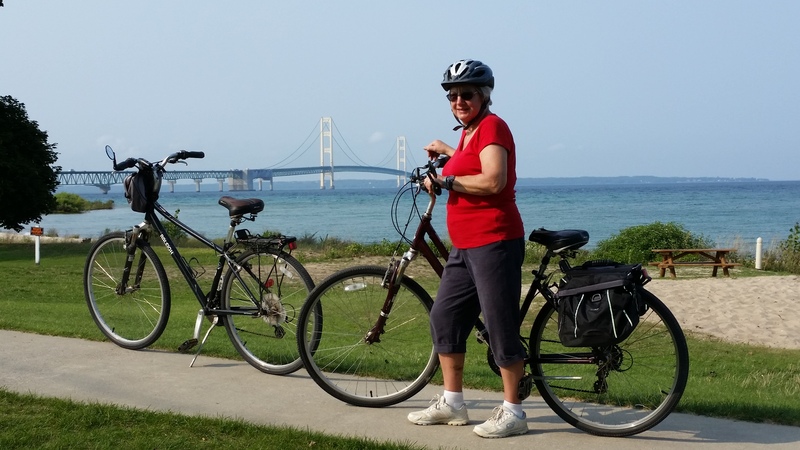 There are some great bicycle trails in northern Michigan. 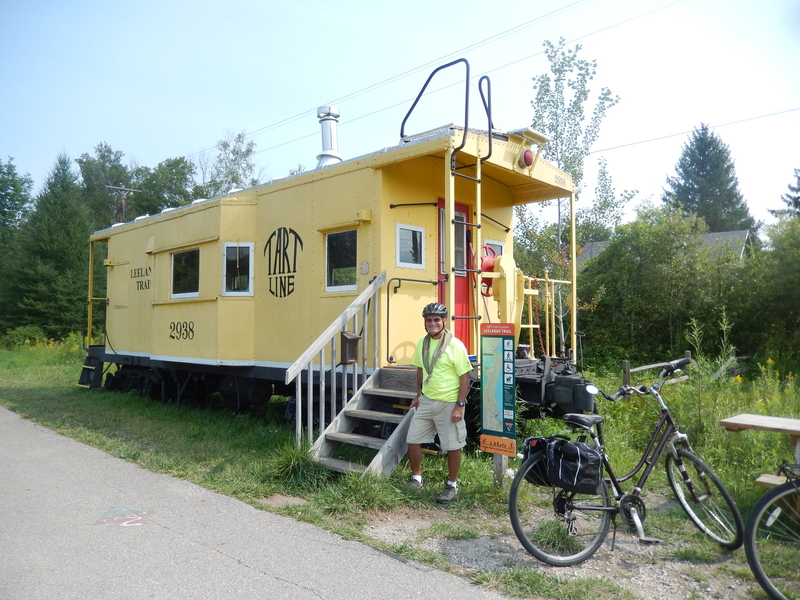 We rode from Suttons Bay into Traverse City along the Leelanau Trail. This trail is a part of the Rails to Trails initiative that turns the unused railroad right of way into hiking and biking trails. It was a great ride through the countryside. We arrived in Traverse City and had a picnic lunch near the shore of the West Arm of Grand Traverse Bay. 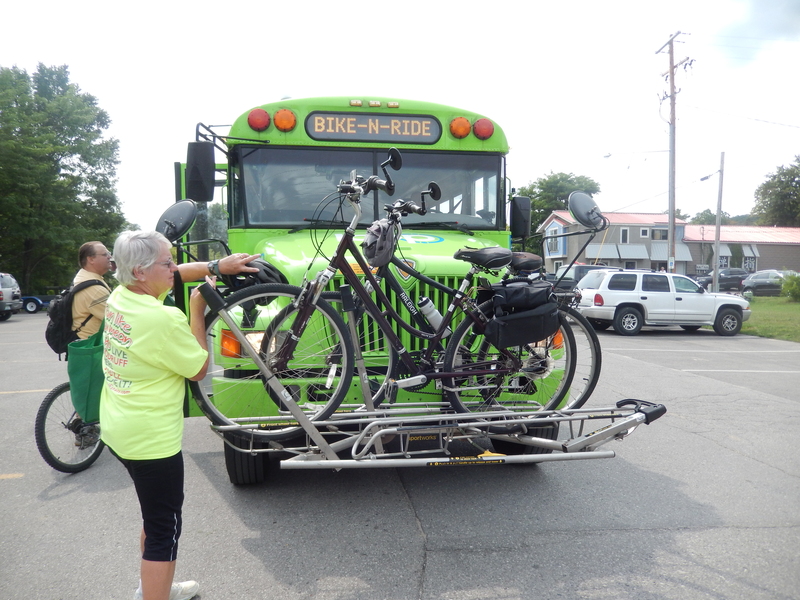 Then we boarded a bus that took us and our bikes back to Suttons Bay. It’s a great deal, even better for seniors who get half price. The day before we left we joined Jim and Diana and visited the Leelanau Historical Society Museum. 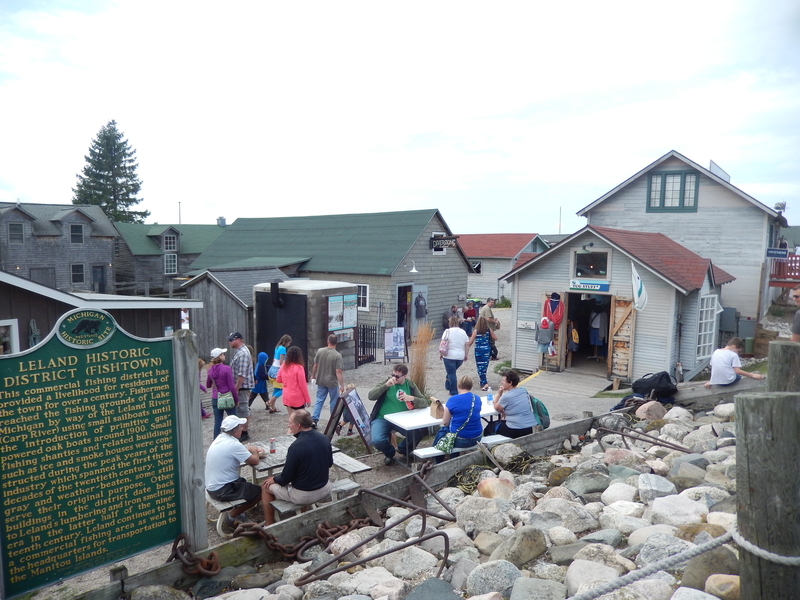 This small museum gives a personal feel to the history of the Great Lakes, especially North and South Manitou Island. We checked out another small winery and had lunch at the Cove in Fishtown. A nice way to end our visit to the Leelanau Peninsula. August 30th saw us driving along US-31 to Mackinac City. This route took us along the Lake Michigan shoreline with some great views. In Mackinac City we stayed at the Mackinaw Mill Creek Campground. Mill Creek is a VERY big campground with nice facilities for kids, families, and adults. One of the nicest features is that they have left the shoreline as a public space without campsites. They have fire circles all along the shore so you can have a campfire and watch the night fall on Lake Huron and the “Big Mac,” the Mackinac Bridge that connects the Upper and Lower Peninsulas. We arrived early enough that we had plenty of time to explore the town. The South Central State Trail, another Rails to Trails bicycle trail runs right past the campground into downtown Mackinac City, so we rode our bikes into town. After checking out the area, we decided it was time for a good Michigan pasty for dinner. Pasties are very popular in northern Michigan thanks to the Welsh miners who made this old world meal to pack for lunch in the copper mines of the Upper Peninsula. I recommend Cunningham’s on Main Street for this treat. The next morning we were up early to take the ferry to Mackinac Island. All of the ferries run shuttles from the local hotels and campgrounds – they’ll even shuttle your bikes! We took our bikes on the ferry so we could ride around to the various sites. The day started out a little cool and foggy, but soon cleared into a beautiful day. Our first stop on the island was Fort Mackinac. This fort, built by the British during the fur trading days changed hands several times during the Revolution and War of 1812. It has been years since I last visited the fort and the displays have been much expanded and improved. State Park staff put on demonstrations of weapons firing and lead tours throughout the day. We spent the rest of the day riding around the island. Along the way we visited the Arch Rock, took a short hike on a nature trail through a bog, then rode up some steep hills to visit Fort Holmes. Fort Holmes was initially left undefended by the British, then later by the Americas. In 1814 the British captured Fort Mackinac by establishing an artillery position at the site of Fort Holmes. When I first visited this site, it was nothing more than an old trench. In 2014 the State of Michigan was able to finish the reconstruction of the fort and it is now an excellent reconstruction of the final structure. 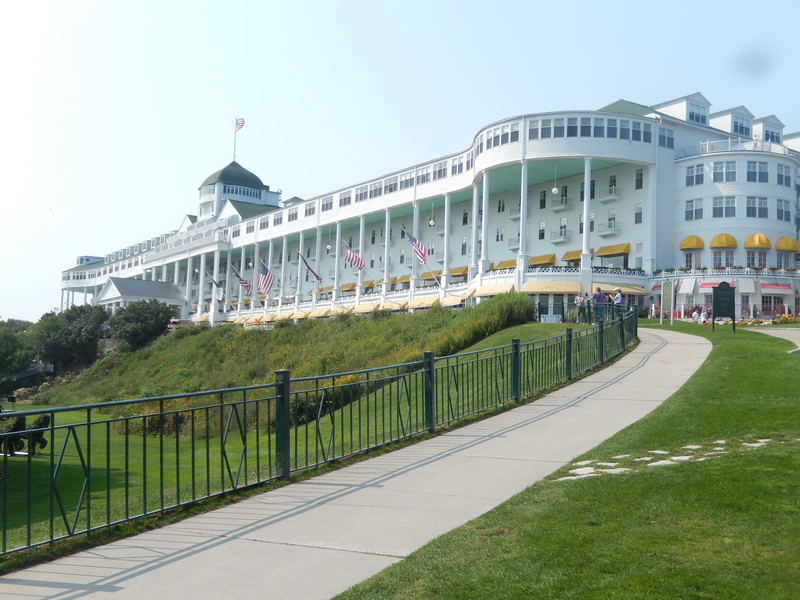 You have to at least ride or walk past the Grand Hotel. For a fee they will let you walk onto the front porch (the longest porch in the world). We finished our visit by treating ourselves to delicious ice cream cones, then took the ferry back to Mackinac City. The next day was a bit of a sightseeing marathon. We rode our bikes into town to tour the Coast Guard Cutter Mackinaw, “The Queen of the Lakes.” The Mackinaw was built at the beginning of WWII to keep the shipping lanes of the Great Lakes open so iron ore could continue to be shipped to the steel plants without interruption. Until 2006, the “Mighty Mac – the Heavyweight Champion” did just that. Her motto was, “We move ships when no one else can!” In 2006, she was retired and replaced with the new, more powerful Mackinaw. 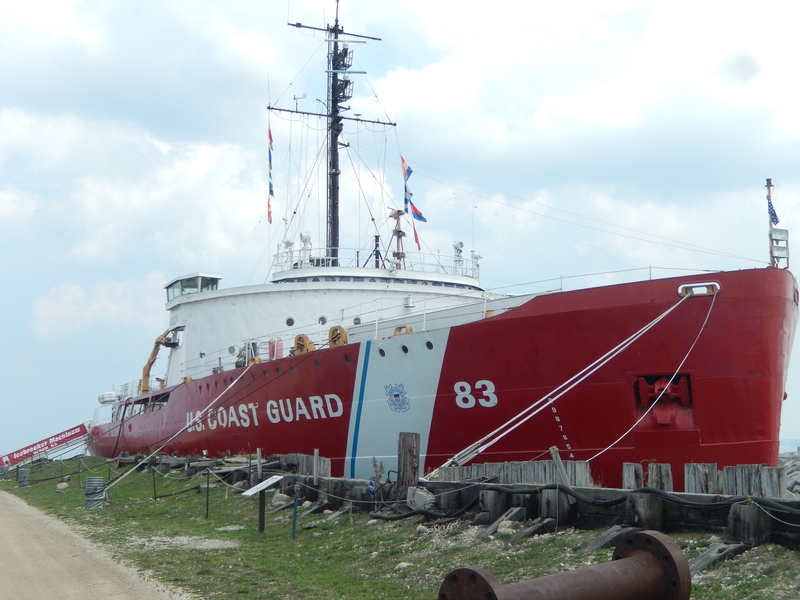 It is unusual for the Coast Guard to name a new cutter after an old one, but they wanted to continue the legacy of the Mackinaw on the Great Lakes. The original Mackinaw is now a floating museum in Mackinac City, operated by a volunteer foundation. The tour is very informative with displays and videos throughout the ship. I recommend it to anyone coming to the Mackinac City area. I am a true lighthouse fanatic. I never saw a lighthouse I didn’t want to tour. The old Mackinac Point Lighthouse is one of my favorites. The Mackinac Point Light helped to guide ships through the Straits of Mackinac for decades. When the Mackinac Bridge was completed with its own system of lights and fog horns, the Mackinac Point Light was inactivated and eventually taken over by the Michigan Department of Natural Resources. Jim Belisle, our friend from Cherry Hill RV Resort, made it personal when he told us that his grandfather had built the original Mackinac Point Lighthouse. Jim is on the board of the non-profit foundation that restored and maintains the lighthouse. 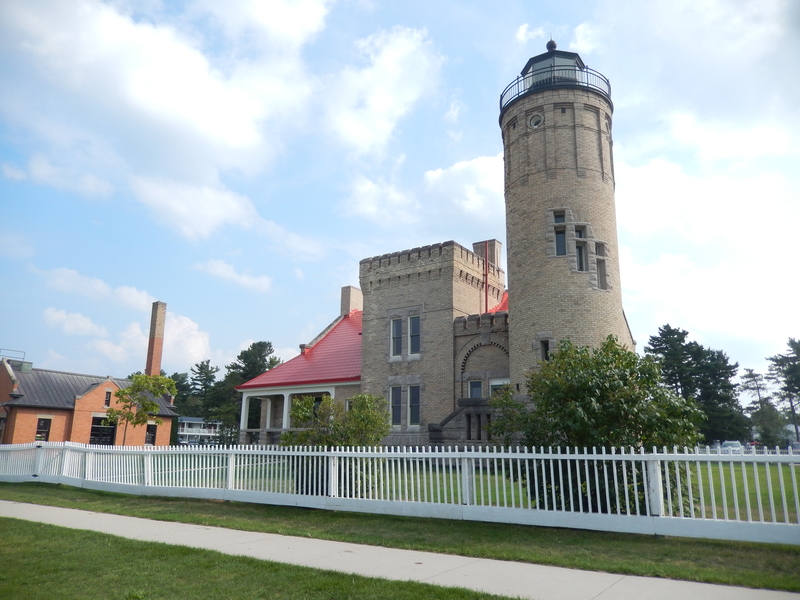 Jim wrote a detail post about the Mackinac Point Lighthouse on his own blog, ExploRVistas. While we didn’t visit it, Colonial Fort Michilimackinac is another great attraction. Fort Michilimackinac was the initial French settlement, later occupied by the British. Eventually the British governor realized how vulnerable the settlement was at this location and relocated to the easier defended Mackinac Island. 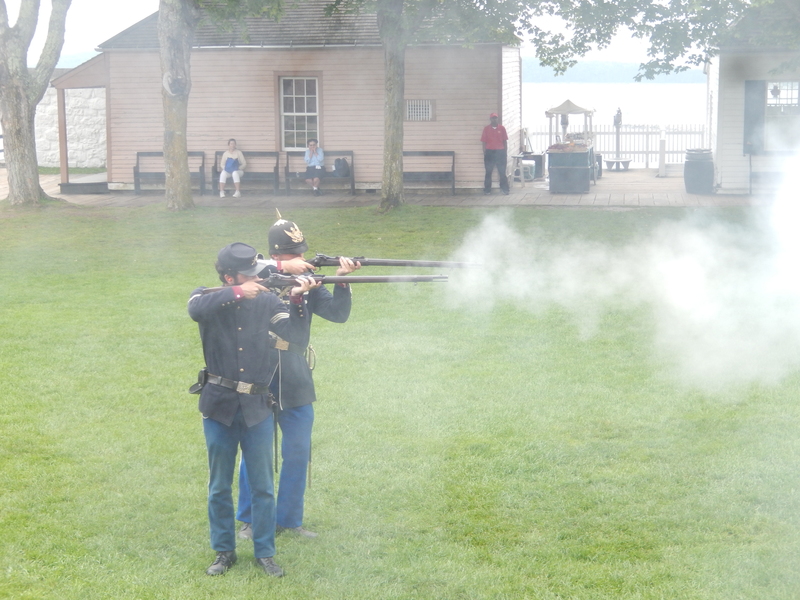 As on Mackinac Island, State Park re-enactors give demonstrations of period activities. A unique location is The Headlands, operated by Emmet County. This is the Sixth International Dark Skies Park in the United States and the ninth one in the entire world. An International Dark Sky Association (IDA) International Dark Sky Park (IDSP) is a land possessing an exceptional or distinguished quality of starry nights and a nocturnal environment that is specifically protected for its scientific, natural, educational, cultural heritage, and/or public enjoyment. 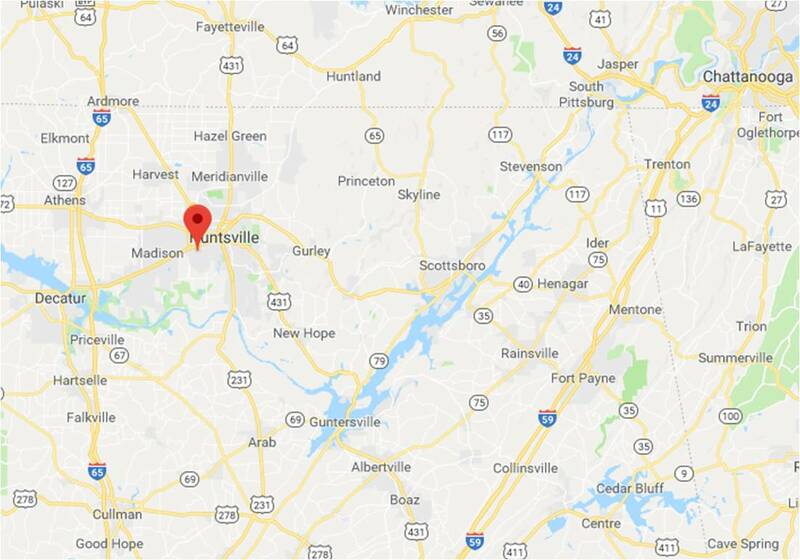 The land may be publicly owned, or privately owned provided that the landowner(s) consent to the right of permanent, ongoing public access to specific areas included in the IDA designation. 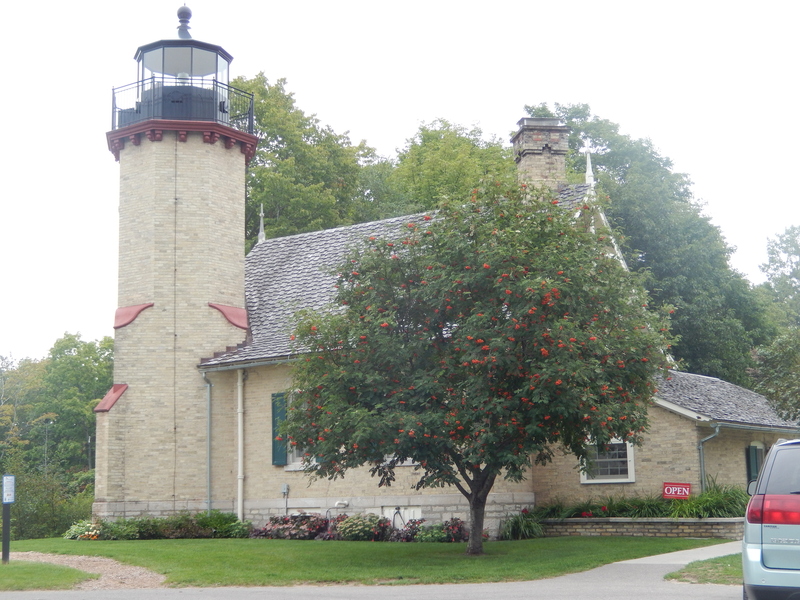 Our final stop was the McCulpin Lighthouse, also restored and maintained by Emmet County. It was originally built in 1869. It was purchased by Emmet County in 2008 and opened for tours in 2009. This is another well-maintained lighthouse. They have also built and maintain a short trail to the lakeshore that highlights the evolution of settlers in the area. Along this trail they have life size photos of these settlers and what they did to contribute to the area – just a great way to bring history to life. On September 3rd, we drove to meet the rest of Pat’s family at the cottage on Rifle Lake for Labor Day. As usual we had a great time boating on the lake, having dinners together, and generally hanging out. It was a nice change of pace to live life in the slow lane! On Labor Day, after a last trip around the lake in the pontoon boat, we packed up and headed back to Bad Axe. 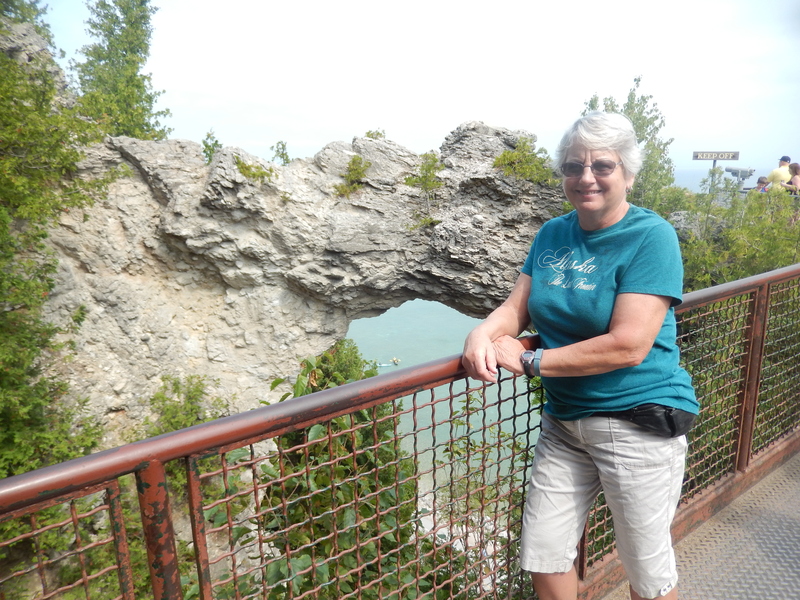 This entry was posted in Fulltime RV, Michigan, Michigan Traveler, National Parks, Working on the Road and tagged Coast Guard Cutter Mackinaw, Fort Mackinac, full-time RV, fulltime RV, Kayaking, Mackinac Island, McGulpin Lighthouse, Platte River, RV Forums, Suttons Bay. Bookmark the permalink. Great post, Bob! We sure had fun with you and Pat! I’m glad you made it to McGulpin Point Lighthouse. They really did a nice job on it. Sounds like you two really had fun in the Mackinac area. We had a great time, busy busy, but fun! 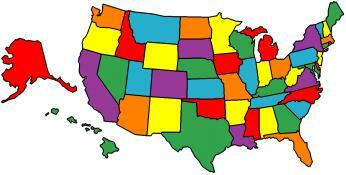 We had not vacationed in the area in a long time and a lot of the historical sites were much improved. McGulpin Point Light was the icing on the cake. Certainly you can use the photo. Happy to be of service.